To many people, having something in common with Ernest Hemingway, Sir William Blake, Oscar Wilde, Stephen Fry or Agatha Christie would be something to celebrate. I am in esteemed company, or so it appears. Whilst I would love to have a small amount of the talent for writing that those mentioned possessed, the trait that we share is something darker and certainly nothing to shout about. I suffer with depression. Oh, depression? You mean you sometimes feel a bit sad? We all get like that sometimes, get a good night's sleep, get a grip, things will look better in the morning. Isn't that what you mean by depression? Well, no actually. Depression is something people seem reluctant to talk about - myself included - because you are automatically assumed to "have something wrong with you" and are judged by people who know little about either yourself or the condition itself. It is difficult to comprehend how depression can cripple someone who is outward looking, funny, intelligent, esteemed, admired or loved. It isn't a character flaw, nor is it something that can be ignored. For myself, it comes in waves normally as I am experiencing personal issues, flare ups of pain in my health condition or when bad news is received. Simple things such as answering emails, dealing with correspondence, keeping myself and my home clean & tidy or doing things that normally give me pleasure like reading, painting or writing seem so daunting that I revert into myself even more. It makes you feel hopeless, useless and you question your role in the world and whether or not your family and friends deserve you. You sink into a deep black hole, so dark and black it makes you feel that you can never climb out. Sometimes it lasts a short while, other times it can last weeks or even longer. But it is at those darkest, bleakest times that a support network along with a prepared plan of recovery - which could be medication, cognitive behaviour therapy, natural or alternative therapies - help provide the tiny ray of light that brings you back into the real world. My depression is not that severe, when compared to others. But it floors me in ways that make me withdraw into myself and it must seem to friends and acquaintances that I am ignoring them and my responsibilities. I am not, but at times like that I need you to shine a torch and light a candle for me so that I can bring myself out of the darkness and into the light once more. 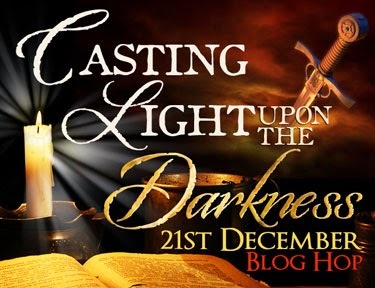 Why not visit the other blogs on this fantastic one day blog hop and find out more about the winter solstice throughout the ages! 8. Petrea Burchard : Darkness - how did people of the past cope with the dark? I've been in that same Black Hole Stuart - even to the point of (very poorly) attempted suicide. It's very lonely in that hole isn't it - but that hand held out and the glimmer of that torch can mean such a lot. Having been at the bottom of the deepest hole I an now (I think) strong enough to ensure I never get to that place again, although I do occasionally fall into a hidden ditch.... but I know I can build a ladder now and climb out - I know this because I've already done it. That knowledge is great strength. Sometimes the needed ladder is a long one, sometimes it's only a couple of rungs. BUT I HAVE my ladder, and that makes a lot of difference. If ever I write my autobiography I'm going to call it Avoiding Ditches. One tip for people suffering from SAD (seasonal depression) make sure you take Vitamin D on a regular daily basis throughout the year - it really does work. And remember this: we are the strongest people - because we KNOW we can survive the blackest hole or deepest ditch. With you both. A place you hope nobody else has been, but so many more than you think have. TG, mine only lasted a few months. Like Helen, I have built a ladder, plus an alarm system in my head. As writers, we have the ability to observe and be aware of the mental world and I think that really helps. I am a SAD person which is why I am pathetically glad when 22 December arrives. My best friends are my vitamins and my SAD light. Perhaps we should form a club. I remember being so depressed I did not want to get out of bed. My children could not go out to play in the 115 F. heat, so I had to get up and take them swimming. It was the hardest thing I ever did! It is very important to remind depressed people, especially if they are suicidal, that the depression will pass and life will become good again. I recently saw my once suicidal son happily kissing his bride. If the problem is something more permanent like bipolar disorder, do not give up on finding the right medicine. There is help! Never been a sufferer, thank goodness, but my mother suffered very badly. This was the 1950s, of course, so the "normal" treatment involved lengthy spells in an institution and regular electric shock therapy. Looking back on it, these were almost certainly post-natal problems and, most likely, serious nutrient deficiencies - the cause of far more depressive illnesses than just SAD, I think?? Stuart, Thank you for sharing this beautiful and so very personal reflection. I have lost 2 friends to this - brilliant, warm, loving people who could not climb out of that hole. My heart goes out to you, and I applaud you for managing to find your way, again and again, out of that darkness and into the light. Not suffered but seen it a plenty as a GP. Indeed they say anything up to 25% of a GP's average surgery will be depression or related. Stuart, that is a really brave and moving post to share on this darkest of days, and a timely reminder that depression can strike even at the brightest, sunniest time of year - the darkness from within masks any light shining in from outside. I too have suffered from depression off and on over the years, thankfully not for a long time now, but enough to understand where you're coming from. I know the hardest thing in the middle of a bout of depression is to reach out to friends who might help you, but know that we are here for you, always. Thank you for such a thoughtful final piece on this brilliant blog tour - and thanks again to the wonderful Helen Hollick for mobilising us all with such fantastic results. Happy Solstice to us all - now let there be light! Thank you for sharing, Stuart. Hugs! Unless you've experienced it, you have no idea what it's like... And friends - even "only" virtual friends - should be the torch to help other friends along through times of darkness. Very brave of you to post about this difficult issue - and if I can, I will be glad to light your way. Thank you for this insightful post. I have walked in your shoes. When I did not have depression I suffered an anxiety disorder, and sometimes the 2 hit together. It is so wrong that there is still a stigma about it, as these ailments are so common. This is a brave and thoughtful post. With so many people commenting about sharing your feelings, I wonder if depression is common to writers? I suffer from SAD, but "suffer" seems a strong word in the face of long-term depression. For someone to tell you to "cheer up" or "snap out of it" is like saying those things to someone who is grieving. It's just not possible. Healing requires time and, as you said, support. Very glad to hear you have a support network and plan of recovery - I am trying to find one at the moment for someone close to me and it's not easy! Stuart, thank you for sharing this post. While I haven't experienced depression, I've had anxiety/panic disorder since I was in my teens. I know the two aren't the same, but they do seem to share some of the same symptoms/effects. I, too, look forward to the solstice because I don't do so well during the long dark days. All the best to you. Thank you Stuart. I'm easily depressed, though better now than I used to be. I had a couple of horrific years along the way, and have had friends who were lost to this darkness. It's good to see a post that talks about this so openly, Stuart. Getting the subject itself into the light, whether for oneself or others, is such an important aspect of tackling it.